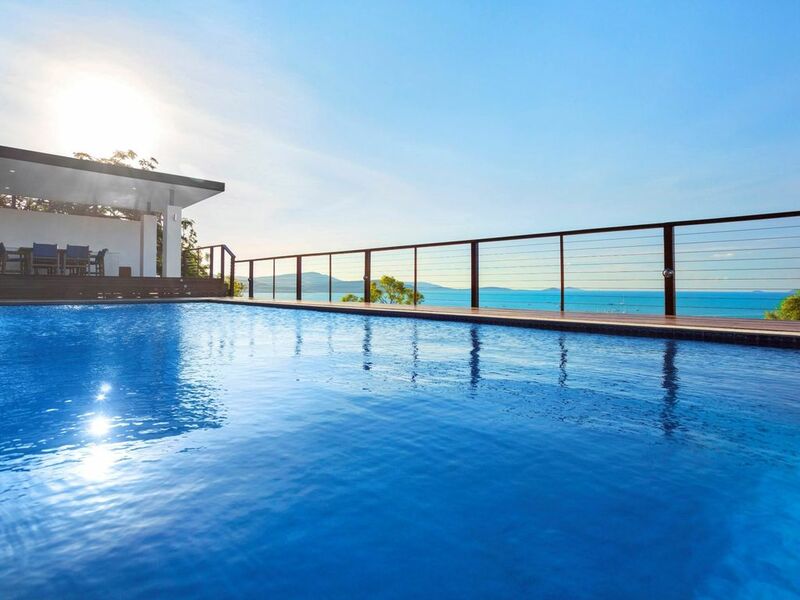 From high on the hill above Airlie Beach you can escape to the luxurious private pool, relax on the resort-style pool deck or entertain the whole family in the covered BBQ pavilion. Treat your senses to the sun, salt and water features that are all part of your Nautilus experience. At anytime of the day or night you can watch the world go by from your expansive upper level deck with its birds eye view over Abell Point Marina and Airlie Beach. Nautilus on the Hill is a double storey five-bedroom, three-bathroom home, finished with only the most superior of fittings. The opulent and spacious kitchen is seamlessly finished, complete with elegant, sleek appliances, a bold gas cook top and a complimentary bottle of wine for your stay. Your dining options are endless, with indoor and outdoor settings depending on your mood. With a well-designed laundry area and a family-size washing machine and dryer, keeping clean wont even feel like a chore. Free Netflix and Wi-Fi are all part of the package. Thank you so much for your review of Nautilus On The Hill, we certainly love this property too. We appreciate your feedback and will definitely speak with the owner regarding the steps and beds. The perfect holiday home, amazing views! Wow! What an amazing holiday home! And such a good price for the space. The house is large, clean and comfortable. The views are to die for and we spent most days in the pool and evening on the deck watching the sunset. The complimentary breakfast hamper was a lovely surprise. We went out for dinner to the Village Cafe Restaurant in town and got 10% off our meal and a complimentary bottle of wine just because we were staying at Nautilus... I couldn't fault the holiday and we will definitely be back!